FESTIVE OUTINGS await. The bad news: “Knead” (Alliance) closes Sunday. 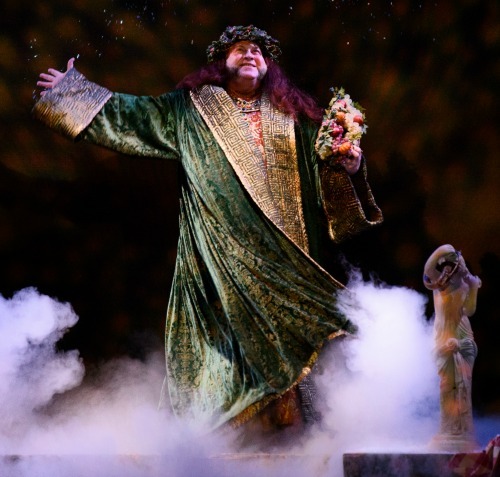 The good news: “Christmas Canteen” (Aurora), “A Christmas Carol” (Alliance), Atlanta Ballet’s new “Nutcracker” and “Frog and Toad” (Synchronicity) open or continue; and the ASO plays its first holiday concert. Intriguing: Aurora’s one-man “This Wonderful Life.” Pictured: The Alliance’s “Christmas Carol” company. Photo by Greg Mooney. Christmas Canteen. THROUGH DEC. 23. 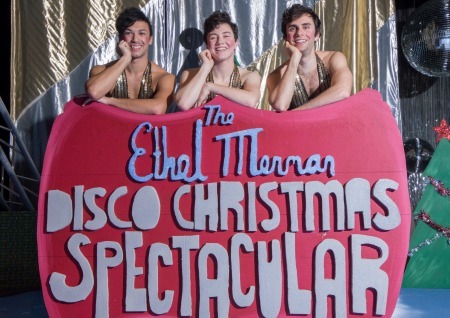 Aurora Theatre joyously stages its 23rd original holiday revue. 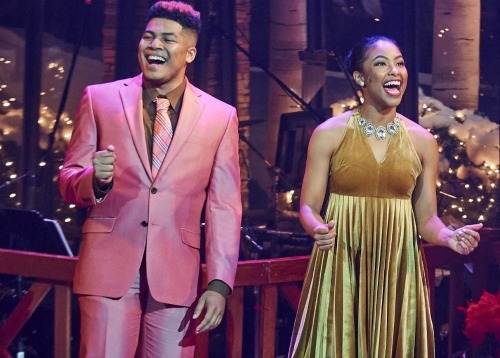 A singing, dancing cast of eight channels the golden days of TV Christmas specials (think Bing Crosby and Andy Williams) and mixes in a few contemporary moves to create a show that will have you glowing with the magic of the season. Ricardo Aponte and Anthony P. Rodriguez co-direct. Aponte also choreographs, with musical direction by Ann-Carol Pence, who also performs. This year’s merrymakers are Galen Crawley, Jimi Kocina, Christian Magby, Kristin Markiton, Chani Maisonet, Kenny Tran, Cecil Washington Jr. and Briana Young. Check the Aurora website for sold-out dates before you go. $30 and up. 8 p.m. Tuesday-Friday; 2:30 + 8 p.m. Saturday; and 2:30 p.m. Sunday. 10 a.m. matinees ($20 and up) Dec. 11 + 18. Aurora offers free, covered, attached parking in a city deck at 153 E. Crogan St. Details, tickets HERE or at 678.226.6222. A Christmas Carol. OPENS DEC. 12. The biggest “bah humbug” of them all. 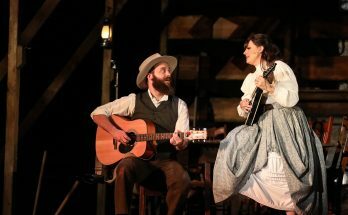 The Alliance Theatre takes its musical, multicultural telling (penned by David H. Bell) back to Cobb Energy Performing Arts Centre for a second season. David de Vries returns as Ebenezer Scrooge. Joining him again are many familiar faces, including Neal A. Ghant (Bob Cratchit); Bart Hansard (Fezziwig, Ghost of Christmas Present); and Courtney Patterson (Ghost of Christmas Past). Rosemary Newcott once again directs. The caroling is gorgeous, and irresistible. Family-friendly. Note: Metal detectors are in place for every performance, so allow extra time to enter the venue. $14-$115. Through Dec. 24. 7:30 p.m. Wednesday; 8 p.m. Thursday-Friday; 2:30 + 8 p.m. Saturday; 2:30 p.m. Sunday. Also at 7 p.m. Dec. 23. 2800 Cobb Galleria Parkway, Atlanta. Details, tickets HERE or at 404.733.5000. Discount tickets at PoshDealz.com. Knead. CLOSES SUNDAY. 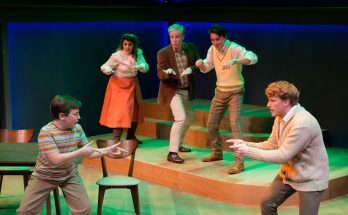 An Alliance Theatre world premiere. In the wee hours, a woman attempts to bake bread from her mother’s incomprehensible recipe. But the ingredients of time and memory keep interfering, and the process — the kneading, rising, shaping and baking, all in real time — becomes a journey into unpredictability. Bread will be baked and, perhaps, shared. 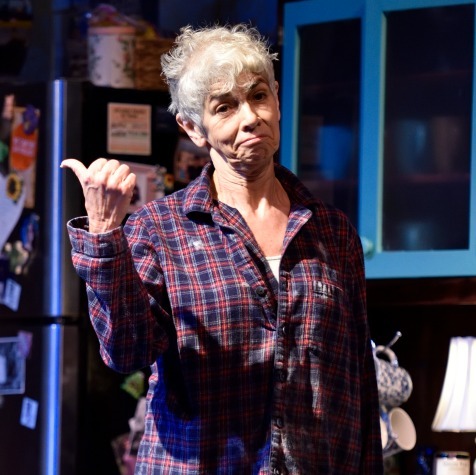 Two-time Suzi Bass Award-winning actor Mary Lynn Owen wrote the one-person script, her first, and is the lone cast member. Knead was developed in the Alliance’s Reiser Atlanta Artists Lab and was a semifinalist for the prestigious O’Neill National Playwrights Conference. David de Vries (the same artist who plays the Alliance’s Ebenezer Scrooge) directs. Recommended for age 14 and up. $45; $10 teens. 7:30 p.m. Thursday; 8 p.m. Friday; 2:30 + 8 p.m. Saturday; 2:30 + 7:30 p.m. Sunday. Hertz Stage, Woodruff Arts Center, 1280 Peachtree St. NE. Details, tickets HERE or at 404.733.5000. Miss Bennet: Christmas at Pemberley. THROUGH DEC. 23. 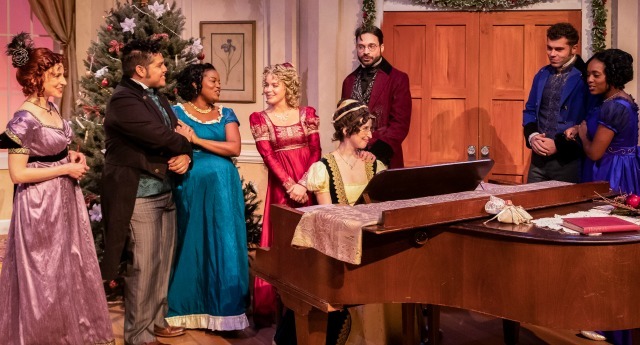 Theatrical Outfit reprises its 2017 holiday hit with this script by Decatur-born, San Francisco-based playwright Lauren Gunderson and colleague Margot Melcon. This witty sequel to Jane Austen’s Pride and Prejudice focuses on socially awkward sister Mary and a potential romantic entanglement. Miss Bennet is the fourth-most-popular play in America this season, with productions at 13 theaters nationwide. Notable Atlanta theater artist Carolyn Cook directs the Outfit staging. Amelia Fischer and Jonathan Horne return as Mary Bennet and Arthur De Bourgh. Also returning are Devon Hales and Juan Carlos Unzueta. New to the cast are Stephanie Friedman, Jeanette Illidge, Jasmine Thomas and Justin Walker. $18-$51 plus fees. 7:30 p.m. Wednesday-Saturday; 2:30 p.m. Sunday. Also at 11 a.m. Dec. 13 + 20. The Outfit performs at the Balzer Theater at Herren’s, 84 Luckie St. NW. Details, tickets HERE or at 678.528.1500. Discount tickets at PoshDealz.com. A Year With Frog and Toad. OPENS FRIDAY. A rare family show that speaks to adults as well as the kiddos. This musical tale about a year in the lives of two best friends returns to Synchronicity Theatre. 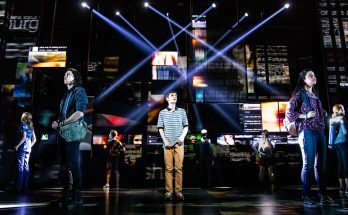 The Tony-nominated show follows the cheerful, popular Frog (Matt Baum) and the rather grumpy Toad (Greg Maurice Hunter) through four, fun-filled seasons. It’s part vaudeville and part make-believe as well as funny and moving. Also in the cast: Taryn Carmona, Elliott Folds and Lyndsay Ricketson. 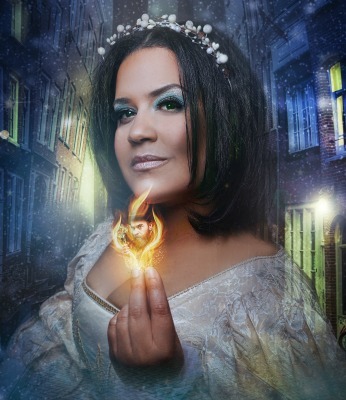 Jenna Tamisea, artistic director of GLOW Lyric Theatre in Greenville, S.C., directs. Synchronicity’s 2006 staging won Suzi Bass awards for outstanding musical, direction and costume design. The show is based on the Newbery and Caldecott Medal-winning books by Arnold Lobel. $16-$31 (under age 2 free). Through Dec. 30. 7 p.m. Friday; 1 + 4:30 p.m. Saturday; 2 + 5:30 p.m. Sunday. School matinees available. Every Friday is PJs and Play. Kids in PJs get free milk and fresh-baked cookies. Synchronicity Theatre is in the Peachtree Pointe Complex, 1545 Peachtree St. NE. Details, tickets HERE or at 404.484.8636. 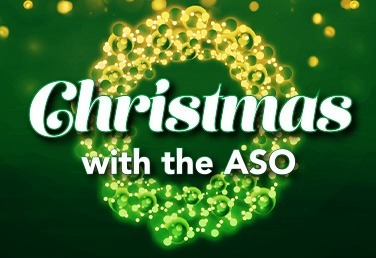 Christmas With the Atlanta Symphony Orchestra. SATURDAY-SUNDAY ONLY. Four performances. These concerts continue a tradition started decades ago by then-music director Robert Shaw. The Gwinnett Young Singers and the Morehouse College Glee Club join the orchestra and ASO Chorus to perform carols and hymns. Norman Mackenzie conducts. $29-$79. Selling well. Limited seating remains (best availability is 8 p.m. Sunday). 3 + 8 p.m. Saturday-Sunday. Symphony Hall, Woodruff Arts Center, 1280 Peachtree St. N.E. Details, tickets HERE or at 404.733.5000. Curious Holiday Encounters. THURSDAY-SUNDAY ONLY. This festival of interactive performances takes place throughout the 7 Stages building. Expect an offbeat brand of holiday cheer as you stroll around and check out offerings from the Little Five Points Rockstar Orchestra, Arís Theatre, the Weird Sisters Theatre Project, Atlanta theater artist Rebekah Suellau and others. Artistic director Heidi S. Howard curates. $15-$25. 7 p.m. Thursday-Saturday (last entry at 9 p.m.); 5 p.m. Sunday (last entry at 7 p.m.). 1105 Euclid Ave. NE in Atlanta’s Little Five Points neighborhood. Details, tickets HERE or at 404.523.7647. A Merry Little Christmas With Deb Bowman. SATURDAY ONLY. Singer-actor Deb Bowman (Serenbe Playhouse’s Little Mermaid and A Streetcar Named Desire; Actor’s Express’ Sweeney Todd) serenades the holidays in a sultry style all her own for one night only, backed by keyboards and percussion. $40; $60 VIP table. Grange Hall at Serenbe, 10640 Serenbe Lane, Chattahoochee Hills (about 33 miles southwest of downtown Atlanta). Details, tickets HERE or at 770.463.1110. The Christmas Carol Experience. DEC. 12-30. 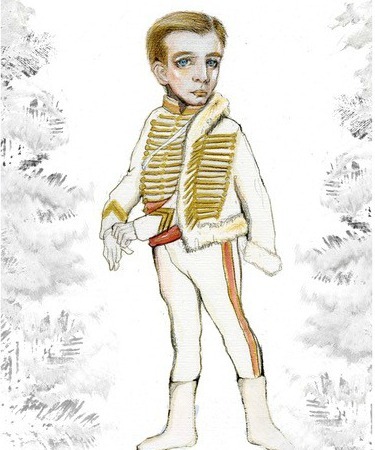 See Charles Dickens’ Christmas classic in a new way. 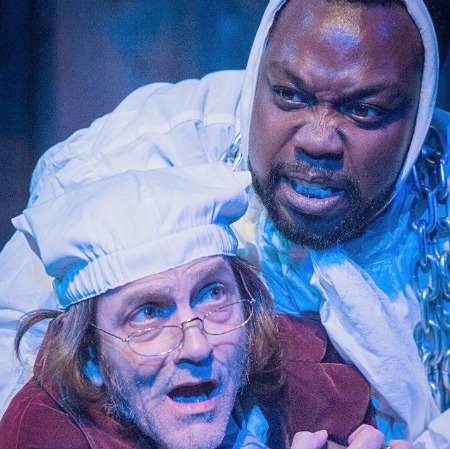 The Scrooge story gets spun on its head in this immersive event. Follow Ebenezer and his otherworldly goings-on through the rooms of the historic Wren’s Nest. Expect holiday merriment, carols and lessons to remember. Atlanta-based actor Daniel Burns is Ebenezer Scrooge. The cast of five includes Rosie Gyselinck, Jordan Patrick, Lilliangina Quiñones and Julie Trammel. Presented by Brian Clowdus Experiences. Clowdus directs. The Wren’s Nest, once the home of Uncle Remus and Brer Rabbit creator Joel Chandler Harris (1848-1908), is now a cultural center that preserves Harris’ legacy and the heritage of African-American folklore through storytelling, tours and student publishing. $50; $45 under 18, seniors, military. 7 p.m. Wednesday-Sunday. Also at 9 p.m. Friday-Saturday. 1050 Ralph David Abernathy Blvd., Atlanta. Tickets HERE. Cansler McGhee (from left), Michael Dotson, Max Mattox. This Wonderful Life. THROUGH DEC. 23. 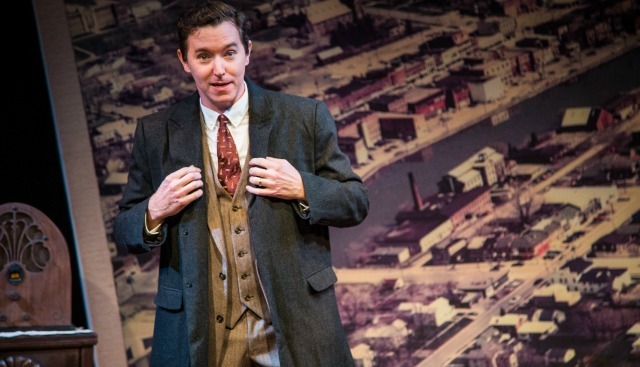 This one-man version of the Jimmy Stewart film classic is new to Aurora Theatre’s holiday lineup. Jeremy Aggers (Singles in Architecture, Hands on a Hardbody) plays everybody — George Bailey, Clarence, Mr. Potter, Uncle Billy, Mary, Mr. Gower, Zuzu, etc. The script is by playwright Steve Murray (whom you might know from his days as an Atlanta Journal-Constitution critic). In repertory with the company’s one-man Charles Dickens’ A Christmas Carol (featuring producing artistic director Anthony P. Rodriguez). Associate artistic director Justin Anderson directs. $20. Performances at 8 p.m. Dec.13, 15, 18, 20 + 22; and 2:30 p.m. Dec. 8, 16 + 23. Aurora offers free, covered, attached parking in a city deck at 153 E. Crogan St. Details, tickets HERE or at 678.226.6222. Discount tickets at PoshDealz.com. Ho, Ho, Home for the Holidays and a Connie Sue Day Christmas. DEC. 14-23. 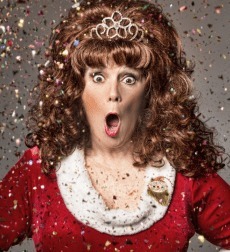 Singer and funny lady Libby Whittemore returns to Actor’s Express with her 10th edition of this happy holiday songfest. It dates back even further, though, to her entrepreneurial days as the headliner at Buckhead’s late, great Libby’s, A Cabaret. She’s joined, as always, by Connie Sue Day, the 31st Lady of Country Music. Expect holiday classics old and new (“Hard Candy Christmas,” “River”), novelty tunes (“Rockin’ Around the Christmas Tree”) and perhaps a verse or two penned by Connie Sue herself. You’ll hear plenty at the two-hour show and go home merry. But beware the Dynel wig. $40. 7:30 p.m. Friday-Sunday. Actor’s Express is in the King Plow Arts Center, 887 W. Marietta St. Details, tickets HERE or at 404.607.7469. CHARLES DICKENS’ A CHRISTMAS CAROL. Ongoing. Through Dec. 22. The return of the one-man telling with actor/artistic director Anthony P. Rodriguez. At Aurora Theatre’s Harvel Lab. 678.226.6222. Discount tickets at PoshDealz.com. Drew Reeves (left), Enoch King. CHARLES DICKENS’ A CHRISTMAS CAROL. Ongoing. Through Dec. 23. As they have for 20-plus years, a handful of actors brings the story alive at the Shakespeare Tavern Playhouse. 404.874.5299, Ext. 0. INVASION: CHRISTMAS CAROL. Ongoing. through Dec. 20. An improvised version of the Dickens classic with surprise special guests. Even cast members don’t know who will show up, or when. Dad’s Garage. Discount tickets at PoshDealz.com. 404.523.3141. ELF THE MUSICAL. Dec. 7-16. The stage version of the 2003 Will Ferrell movie comedy. Allow extra time to get through venue security at the Sandy Springs Performing Arts Center. City Springs Theatre Company. 404.477.4365. Previous Article Holiday fashion goes to the dogs. Literally.